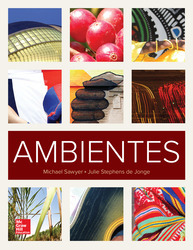 Ambientes provides essential cultural, geographical, and historical context thatwill help students more confidently approach the short films. 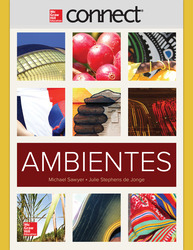 In short, Ambientes was built to anticipate students’ questions and lessen instructors’ need for supplemental resources. Chapters revolve around cultural topics that are current and meaningful, providing students a solid starting point for thoughtful discussion, cultural appreciation, and critical thinking. Each chapter contains extensive annotations that guide instructors through the program, offering suggestions on how to conduct activities, notes, and ideas for expansion to help students think critically about their own culture and the culture of the Spanish-speaking world. Every chapter is supported by a multicultural perspective of embedded interviews with native speakers from multiple Spanish-speaking countries that support the cultural subtopics of the chapter. Exceptional Digital Resources: Improve student learning outcomes by pairing Ambientes with our suite of digital resources within the Connect platform, such as LearnSmart, and more. Writing assignment: Describe a family or friend gathering that happens every year that centers on food.